The transition to smaller form factors hasn't been exclusively a client trend over the past several years, we've seen a similar move in servers. The motiviation is very different however. In the client space it's about portability, in the datacenter it's about density. 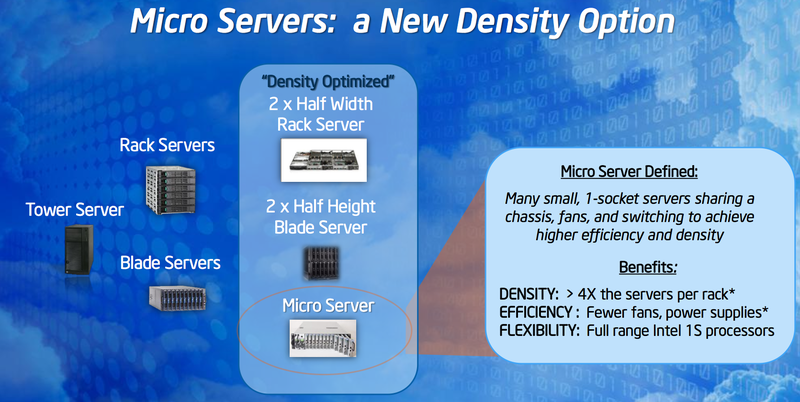 While faster multi-core CPUs have allowed the two-socket 1U server to really take off, they have also paved the way for a new category of density optimized servers: the micro server. The argument for micro servers is similar to that for ultra low power clients. Only a certain portion of workloads really require high-end multi-socket servers, the rest spend much of their time idle and thus are better addressed by lower power, higher density servers. Johan typically argues that rather than tackling the problem with micro servers it's a better idea to simply increase your consolidation ratio into fewer, larger servers. There are obviously proponents on both sides of the fence but Intel estimates that the total market for micro servers will reach about 10% of its total shipments over the next 4 - 5 years. It's a small enough market for Intel not to be super concerned about but large enough that it needs to be properly addressed. Drop clock speed (and voltage) low enough and you can hit the lower TDPs necessary to fit into a micro server. Thermal constraints are present since you're often cramming a dozen of these servers into a very small area. Long term there is a bigger strategy issue that has to be addressed. ARM has been talking about moving up the pyramid and eventually tackling the low end/low power server market with its architectures. 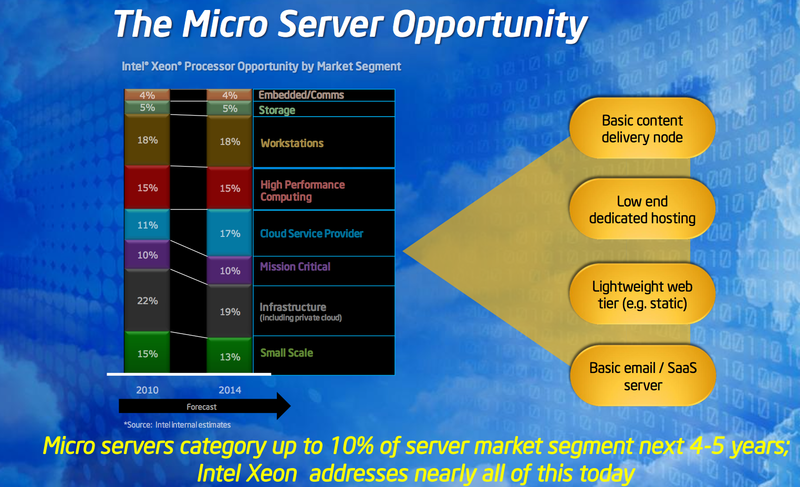 While Xeon can scale down, it can't scale down to the single digit TDPs without serious performance consequences. Remember the old rule of thumb: a single microprocessor architecture can only address an order of magnitude of TDPs. Sandy Bridge can handle the 15 - 150W space, but get too much below 15W and it becomes a suboptimal choice for power/performance. The solution? 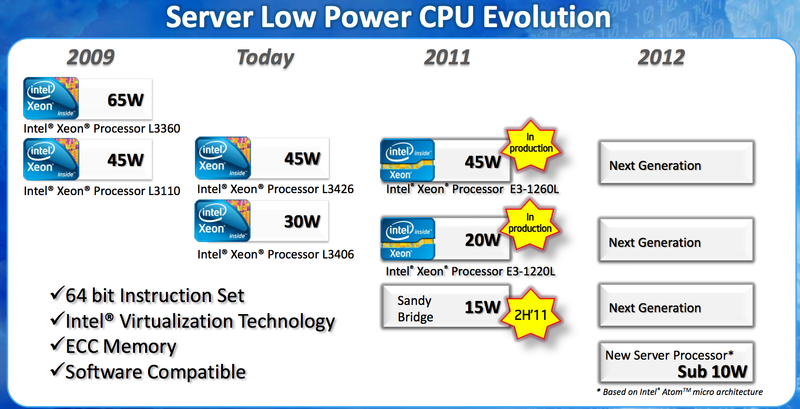 Introduce a server CPU based on Intel's Atom architecture. And this is the bigger part of the announcement today. 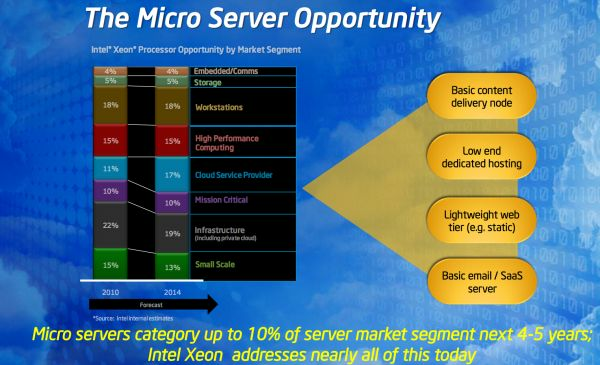 Starting in 2012 Intel will have an Atom based low power server CPU with sub-10W TDPs designed for this market. Make no mistake, this move is designed to combat what ARM is planning. And unlike the ultra mobile space, Intel has an ISA advantage in the enterprise market. It'll be tougher for ARM to move up than it will be for Intel to move down. Intel's slide above seems to imply that we'll have ECC support with this server version of Atom in 2012, which is something current Atom based servers lack. The only real question that remains is what Atom architecture will be used? We'll see an updated 32nm Atom by the end of 2011 but that's still fundamentally using the same Bonnell core that was introduced back in 2008. Intel originally committed to keeping with its in-order architecture for 5 years back in 2008, that would mean that 2012 is ripe for the introduction of an out-of-order Atom. Whether or not that updated core will make it in time for use in Atom servers is still up for debate. "Starting in 2010 Intel will have an Atom based..."
Not an effective server chip, that's for sure. Bobcat is absolutely not suited for server loads. It's "for sure?" Did you design the Bobcat core, or what? "Bobcat is absolutely not suited for server loads." Well, compared to Atom is SURELY is. The ONLY ingredient missing is ECC. On the other hand Atom having 1/2 the performance on top of missing ECC has just been nominated by Intel to the Microserver space.